Hotel rooms, resorts, bed and breakfasts, cabins, hostels, even the home of a best friend or relative where you stay overnight can harbor all sorts of adverse health reactions. The trick is to outguess those illness triggers by bringing some simple tools with you to guard against common, yet sometimes devastating health risks. A handheld UV sanitizer can help protect the traveler or vacationer who comes in contact with all sorts of surfaces, not all of which are clean. In fact, few of them are. From TV remotes to bathroom door handles, pillows and bedding to carpet areas where allergens such as mold and fungi can take hold due to exposure to bare, wet feet, it is important to give these risk spots a thorough cleaning. 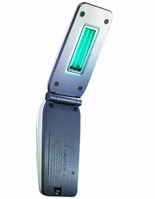 You can protect yourself and your family wherever you stay by using the CleanWave UV-C Sanitizing Wand. This handheld UV-C light wand kills 99.9% of viruses that cause colds and flu, eliminates bacteria and mold, kills E.coli, MRSA and Inflenza A (H1N1) and works against bed bugs and dust mites too. The light emitted by this wand neutralizes the genetic material of viruses and bacteria, knocking them helpless to invade your system. This lightweight (1.5 lbs) wand travels easily and is easy to use. Just direct the light at the area you want to clean, and the light does the work for you, eliminating surface dwelling germs and environmental toxins and penetrating deep into bedding and clothing. Shuts down contaminations everywhere you go. Now that’s traveling smart. If you’re seeking pocket-sized, discreet germ and allergy protection, Zadro Nano-UV Disinfection Light Scanner answers the call. At the size of an cell phone, this UV light scanner does the same big work at the UV-C Sanitizing Wand, yet you can carry it in a purse or pocket with ease. Great for use in restaurants, public restrooms, hotel rooms and other hi-risk contact zones. Brushing your teeth after a day vacation fun involving sweets and other treats always feels good, and the Zadro UV Toothbrush Disinfectant Scanner makes it safe to brush you teeth without fear of picking up sneaky germs from bathroom counters or grubby hands. In fact, just like the sanitizing wands mentioned above, you’ll probably build a habit of using the toothbrush disinfectant scanner all the time given its ability to use UV light to kill viruses and bacteria on your toothbrush. What a great way to protect yourself from unwanted colds and flu! Sitting in an airplane or other tight confines with people all around you breathing germs or kicking up dust and allergens is no way to travel. That’s why travel air purifiers can be key to good health “on the road” whether you plan to travel for business or pleasure. The Wein Mini-mate Wearable Air Purifier helps clean the air for people who suffer from seasonal allergies. This little wonder can prove vital on days with high pollen counts. It also cleans the air in locations where HVAC systems blow around allergens like dust, pollen and dust mites invisible yet harmful to those with allergies and asthma. This wearable air purifier has been tested and proven effective in the elimination of pollens, bacteria, viruses and other harmful airborne substances. The Vapor Eze Clean Air 5000 HEPA Air Cleaner is a compact (8” X 3” X 5”) yet powerful air purifier for areas up to 180 square feet. Of course you can always turn it on in a limo, cab or car as well, because it includes a cigarette lighter adaptor as well as AC adapter. The HEPA filtration on this Vapor Eze Air Cleaner removes particles as small as 0.3 microns, and the interior catalyst filter works with an internal UV lamp to destroy germs, bacteria, viruses and other living organisms. Also, the integrated carbon filter removes gasses, fumes and odors. This air purifier is like a vacation unto itself for those who suffer from allergies and asthma, and for people who generally dislike the idea of breathing in germs, odors and bad air, the Vapor Eze Clean Air 5000 HEPA Air Cleaner is a blessing indeed. We’ve shown you how to protect yourself while staying indoors during your vacation, but when it’s time to head out into the sun for fun, remember to bring a supply of Vanicream Chemical Free Sunscreen. This chemical free sunscreen is recommended by dermatologists for people with chemical sensitivities. 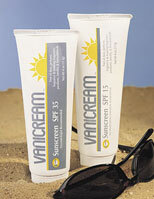 Vanicream offers full spectrum (every wavelength of harmful UV light) sun protection at 35 SPF, so it is one of the most effective chemical free sunscreens available on the market. We know you’ll travel and safe this year using these tips to protect yourself from harmful germs, critters and rays wherever you go. And when you arrive back home, these great products will keep you safe and healthy all the year round.